A beetroot producer has grown a variety offering the same taste without the risk of a red mess. 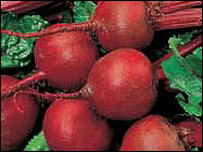 Golden beetroot is being offered by G's, of March, Cambridgeshire, and will go on sale at Waitrose. Anna Walton, with G's, said: "One main complaint we have about normal red beetroot is that 'I don't buy it because it stains'." She said golden beetroot was once common in Victorian gardens but its popularity had died out. G's had sown a successful test crop last year, after importing seeds from America, and produced between 15,000 and 20,000 tonnes this season. "This variety will not stain and it has a slightly more delicate, less earthy taste, " Miss Walton said. She added: "It will be slightly more expensive than normal beetroot but we think people might like it."